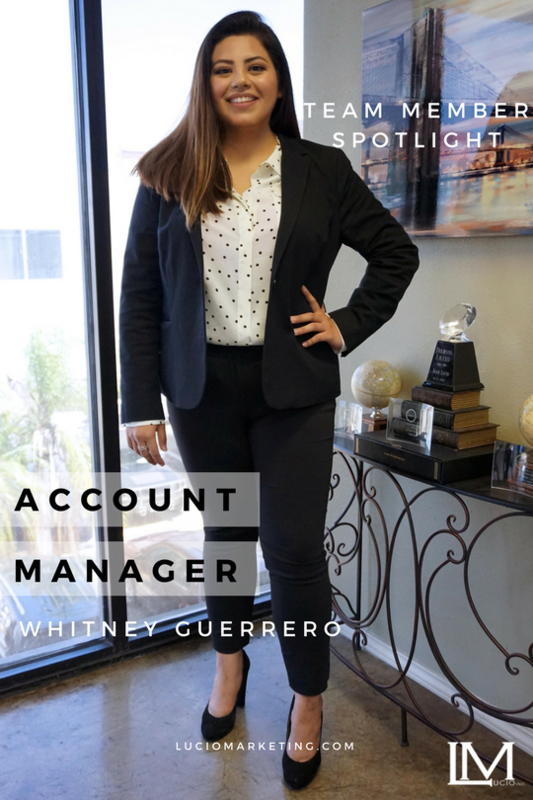 TEAM MEMBER SPOTLIGHT SERIES: Whitney Guerrero | Lucio Marketing, Inc. Welcome to our Team Member Spotlight Series, in which we sit down with one of our team members in a rapid fire Q&A to find out a little bit about the people who make up Lucio Marketing Inc.
Meet Whitney Medellin Guerrero, an essential team member here at Lucio Marketing Inc. We are glad to have her on board our ever-growing team. 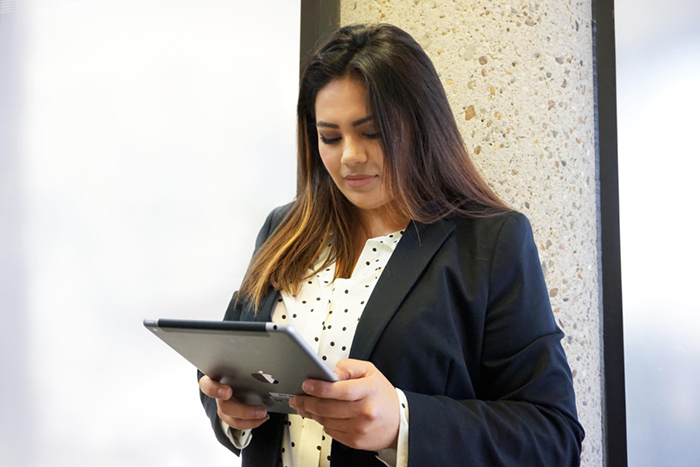 Whitney is one of our top Account Managers who is setting the pace at our McAllen, Texas office. Whitney is originally from Mexico but has called the Rio Grande Valley her home. She is our leading lady who is handling two marketing campaigns from our Fortune 500 clients. Besides her drive for success, Whitney is there to go the extra mile for the team. Whitney is an outstanding Account Manager who is helping shape our business, a growing entrepreneur, and our featured Lucio Marketing Team Member this week in our Team Member Spotlight Series. Like all our Account Managers, the skill Whitney brings to the team is greatly appreciated. A: That is a very good question that deserves an excellent answer so I’m going with the fact that my success awaits. A: My favorite part is that my days are always exciting. I learn something everyday and these lessons make me a better person. A: I’m passionate about growth and I knew coming in that this opportunity was for people brave enough to believe in one’s self. A: I love to sing, in the shower, also reading enough books to satisfy my curiosity. A: Do I really only have to pick one? If I had to pick just one, it would be Snapchat! A: Since so many people are sport oriented I’ve been doing a few things, basketball, volleyball, and some light martial arts. A: My go to place to relax is my bath tube with extra hot water, bubbles and bath salts. A: I have fun wherever I go it’s up to me to decide that today is going to be amazing! A: Lucio Marketing has the best practice groundwork. It helped strengthen my confidence when speaking to all sorts of people at anytime. It’s a breeze now. A: The environment is competitive but it’s about knowing that you are competing with yourself and as a team to become better. A: I’ve had the opportunity to travel to Laredo as well as Orlando to network with top leaders in the marketing business. A: Going to Orlando Florida and meeting the top people in the business was amazing. A: I have a lot of people on that list so let’s keep it safe and go with Mike T.
A: It not about you it’s about your team and them hitting their goals. Thank you Jesus Garcia. A: They have helped me raise my standard from good to extraordinary. A: Take as many notes as you can, call people once you’re out of work, write any doubts you have and ask for help. A: Attitude can make people and it can devestate them as well. A: I don’t have much on my Instagram now but I’m working on it. Feel free to talk to me through Instagram if you want to know more about what the company is about. If you want to find out more about Whitney ’s work or about Lucio Marketing and what we do, follow us on our social media channels.